It’s 2019, and it is my 10th year of using Twitter for the blog, and probably 11th overall. I posted on the blog a few years ago that I thought Twitter just wasn’t the same, and in the past 3 or 4 years, I’ve used it less and less. From the heights of posting 400 times a month in 2011 and 2012, to the lows of the past couple of years, sometimes barely making it to 50 tweets a month. What has changed? Mainly two things. Myself, and the world. It’s almost the end of February, so that means another look at what I’ve been listening to in the February playlist! Music is starting to get good for 2019, with a slow start to the year as it usually is, I’ve found a couple of new tracks which I really like. It was the Brits last week which was fairly decent, but I think that the awards shows these days are just not the same. I don’t think they’re as big of a deal as they used to be, now we’re in the Internet age the artists can reach people online, and they don’t feel as big as they once did. I have to talk about the UK charts, because it’s the first time ever that someone has knocked themselves off number one. Ariana Grande was #1, and then she knocked herself off #1, something which has never happened before. I think it goes to show how the chart doesn’t matter any more, does anyone actually care too much about chart position any more? Anyway, I’ve been listening to the new Robyn track, Send To Robin Immediately, which I really like. The video is pretty good too, you’ve got to check it out. Here’s my playlist in full. When it comes to jeans, It’s not a big secret that for years slim fit, and in particular skinny fit jeans have been stylish and on trend. Times could be changing in 2019, with a lot of loose fits and wide leg jeans coming to the front, will the wide leg jeans trend be here in 2019 for guys? So I’ve been wanting to bring back an old feature for a while, and it sometimes comes and goes, but hopefully I’ll resurrect this properly, I’m talking about my Friday Fashion picks! If you missed it, years back I did a round up of my favourite menswear which is fairly new, if not brand new, and did this for a while. I haven’t done any for a while, but I think it’s the time to bring it back, so I can showcase lots of the new clothing which you can get right now. Primark Black Opulence Men’s Aftershave Review – A £3.50 Scent! A fragrance which costs £3.50…Surely this is going to be terrible, right? Primark have released a few men’s fragrances, and I’ve just got one of their men’s aftershaves, Black Opulence. But what does a £3.50 aftershave actually smell like? I do love my Nike Air Max trainers, and over the past several years, have bought a couple of pair. From the Air Max 95 to the 1, 2017 and of course the 90’s. Nike have been re-releasing some old classics from the 1990’s, we’ve seen the 93 and the 97 make successful comebacks, and it seems that 2019 will be the year of the Nike Air Max2 Light. And I love it! Hey guys! Today I’m going to talk about rich man’s style, but don’t worry, it’s not about spending millions on a custom fitted suit with 24 karat gold threads. It’s about how you can pull off looking like you’ve got a bit of money, even when you haven’t. Dressing like a rich man doesn’t have to cost the earth, in fact you don’t have to spend too much money at all to pull off the look. Sure, the super wealthy millionaires and even billionaires have endless cash to splash on clothing, but how can you pull it off on a budget, without spending a fortune? Yes, it is possible, and surprisingly not hard to look like you’ve got money without spending it on your clothing. If you read on I’ll share some tips on how to dress rich without having money. So it was time for another film night, and I saw that Loving Pablo had been added to Amazon Video, so I decided to give it a watch. It’s a film about the story of Pablo Escobar, told mostly in the point of view from Virginia Vallejo, a girlfriend of Pablo and famous journalist in Colombia. I have seen Narcos, the Netflix documentary series about the same story, which obviously had more detail since it’s spread over seasons and many shows, rather than this which is a 2 hour film. 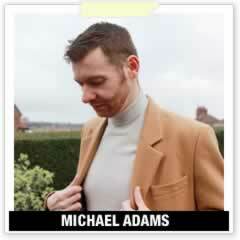 Welcome to Michael 84, my blog about men’s fashion and lifestyle. I write about topics which we all love, including style, male grooming, travel, fragrance and tech, as well as the latest trends in menswear. Sharing my passion with clothing, from high street to high end brands.